Students can pursue focus areas such as: Adult Education, Canada, the North, and the Globe, Community Studies, Cultural Studies, Educational Studies, Equity Studies, Global Change, Heritage and Social History, Literary Studies, Writing and New Media, and Work, Organization & Leadership. Or, if their undergraduate preparation permits, they can undertake a wholly independent program of inquiry with the Independent Track. Each program of study is “capped” with either a capstone course or a final project that allows students to demonstrate how they have consolidated and integrated the knowledge that they brought to, and gained during, the course of their studies. The MA-IS degree can be completed in two years of full-time or six years of part-time study. 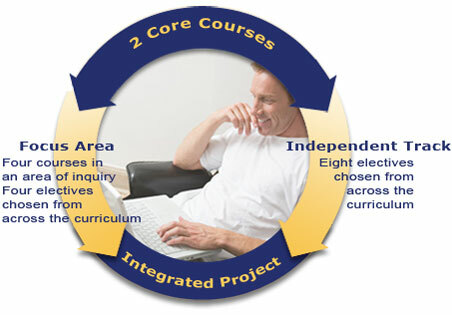 Courses are offered in grouped and individualized study modes. Beginning in fall, winter, and spring, grouped-study courses have weekly reading schedules and online discussion forums, and they are generally completed over a thirteen to fifteen week semester. Individualized-study courses begin on the first day of every month, and are generally completed within four to six months. Students are encouraged to choose courses that sustain and develop their intellectual interests as well as complement their program of study.